Officials in Zhejiang Province have taken down 1500 crosses so far from Church buildings in a nationwide crackdown on human rights attorneys and advocates. Christians in China are holding on to crosses or strapping on to crosses in a bid to stop the demolition. 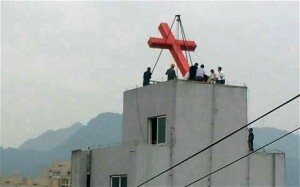 Many Christians are building wooden crosses and painting them red and putting them on top of houses. Chinese Christians have also started praying in large numbers to stop government from these violent crackdowns. Previous story Will My Pet Go to Heaven?